BassesByLeo • View topic - Tribute L-2500 to mod or not? Tribute L-2500 to mod or not? Now I know this has probably been covered to death in other posts, but I can't quite find the answer I'm looking for It might be super straightforward or possibly not. I'm interested to know if I can mod/re-wire my Tribute L-2500 so that the stock two-way series/parallel switch can be changed to outer single coils/parallel? I find that series is a bit too much for me having largely played Warwick Streamer last few years, so I'm not fussed about losing that mode and besides there will be more of an even volume difference between single coil and parallel. I absolutely want to keep all the preamp settings as is (as I use them all for the covers band I'm in - some vintage sounds and some bright modern ones required). I am aware of mods involving a 3-way switch per pickup to get series/parallel/split, but I don't really want to go down this route if possible. If somebody could help point me in a better direction that would be most helpful. Re: Tribute L-2500 to mod or not? The drawing ONLY shows the various connections that change; all else remains as-is. This is a pretty extensive change from what your bass currently has, so if you have any doubts about making the necessary changes yourself don't be bashful about farming it out to a good and trusted tech. The reason I'm thinking of doing this is because I play in a covers band where we are often playing as many as 36 songs per gig, ranging from 60s stuff all the way through to current chart songs. My main gigging bass for the last couple of years has been a 4 string Warwick Streamer LX (with active EMG P-J configuration). This has been fine and together with selecting different pickups and playing with the onboard EQ I've been able to cop most of the bass sounds I've needed i.e. approximations of P bass, J bass, with the appropriate amount of thump or sparkle. However some songs required me to drop tune and this was becoming a bit of a pain, so at one point I was using a second Warwick that was in a lower tuning and I was swapping for certain songs. That was a bit of a nuisance too, so decided to get a 5 string (having decided long ago that 5 strings weren't really my bag). I got a good deal on this brand new Tribute L-2500. I have to say it plays great and I have done several gigs with it now, so no issues on that front. The one sound that I can't seem to coax out of it however is something that approximates a Jazz bass with both pickups on full and tone wide open (think Geddy Lee, or some recent Flea stuff). The closest I can get is coils in parallel, both pickups on, active mode, bass 80%, treble 50%. It has that two pickup thing going on, but the high mids and highs are just in a completely different place to the sound of a single coil J bass. So I guess my question is. Is this mod going to be worth it to allow me to get something like a J bass tone out of this particular bass, or am I best reaching for the Warwick (which yes, I know is PJ but gets close enough) for key songs. Sorry for the long ramble, Keith. bassment73 wrote: So I guess my question is. Is this mod going to be worth it to allow me to get something like a J bass tone out of this particular bass, or am I best reaching for the Warwick (which yes, I know is PJ but gets close enough) for key songs. By fiddling with EQ on the bass & amp you might get close to copping a Jazz tone. Might. Read this to get a feel why I say might. You're thinking about coming at this from another angle than the usual. You're looking at using a single coil from each pickup rather than trying to do it with both coils. From a pickup location standpoint, it's reasonably close to a Jazz. The passive aspect of the circuit is also reasonably close to a Jazz (other than that pesky bass pot). Neither is spot on, but close enough for the girls I run around with. The big difference is the pickup itself. The Fender Jazz (vintage pickups) has smallish AlNiCo pole pieces and probably around 8500 turns of wire per coil. A coil from an L-2500 pickup has huge soft iron pole pieces that are adjustable, a massive ceramic magnet, and 5000 turns of wire. These pickups are going to have a notably different tone to them, with the G&L having a more aggressive tone. Will a single coil modded L-2500 pass as a Jazz? It's unlikely that most people would be able to tell them apart in a live performance setting unless the bass is exposed in a solo situation. In a studio it would be better to have the real thing. I suspect that half the people we play to wouldn't particularly notice if the basslines were played on a uke bass Just us guys this side of the stage that are thinking 'use Les Paul for this song, strat for that one, tele etc..' Matters more for lead guitar I guess. Bass is often noticed more when it isn't there, rather than when it is, strangely! One thing I've never really had time to do in band rehearsals (because we try and cover a lot of stuff and don't really get the chance to knob twiddle) is experiment further with EQ settings, compressor settings, tube drive etc with this particular bass. I'm going to make some time to do this at home and go through a process of making notes on good tones for the G&L then trying them out at practice. So basically work with the bass rather than trying to make it something it's not. It is true that you can get close... enough... for live work. Ken is right. Pickup design is crucial to nailing it, but location is key to barking up the right tree. I don't have an ownership history with the L2000 to have a formed opinion, but can relate with other basses. I have an El Toro with the narrow dual coils/preamp and a couple passive Peavey Foundations with single coil Super Ferrite pickups. 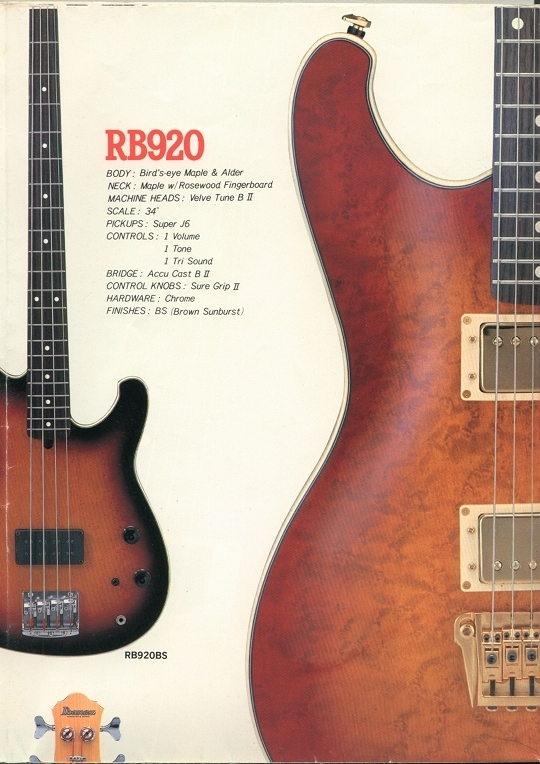 It's clear that they are fundamentally designed to perform like J-type basses despite having pickups that are quite different from traditional J pickup designs. The pickup locations, however, are pretty spot on with a J and (to me) get these get close enough for rock and roll. The harmonic and phase relationship of the pickup's location along the string, as well as to each other, goes a long way in capturing the dialect of an iconic sound. I measured from the inside edge of the nut to get these PU locations. My 3 Js have neck pickups centered anywhere from 27 3/4" to 28 1/16" and the bridge PUs at 31 3/8" to 31 3/4". The El Toro is at 28 1/2" and 31 1/2" and Peavey Foundations are 28" and 32". My T-45 type bass has the pickup centered at 28 5/8", a P bass PU is usually centered at 28 1/2". When using the series humbucker, it's like the L1000: P harmonics, totally different pickup tonality, a nice addition to my traditional P basses for tones. When this bass is in split rear coil, it's right in the same harmonic location as a Ric 4001/3 bridge pickup. It gets a decent simulation of that tone. The split coil of that Peavey T pickup is also in the ball park of a Ric type pickup as far as output and general tonality. Lastly, my Ibanez RB920 has a factory J6 (dual J) centered at 30 5/8", a Stingray PU is centered around 30 1/2". The Ibanez is passive, but having the pickup in parallel mode cops the essence, that punchy, cutty tone Stingrays are known for.